It does take a little creativity and experimenting in the kitchen, believe me, I’ve put in my fair share. kale, use a coconut oil and plenty of herbs, Himalayan salt and nutritional yeast….oh so yum!! base….serve over pasta, rice or spaghetti squash…..another yum!! salads by hiding them in a romaine or green leaf base. 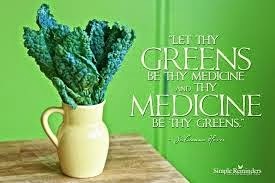 Everyone knows how good greens are….as a blood builder, an internal cleanser &amp; brain food. and plan to spend a little creative time getting to know a superstar vegetable! I’m always looking for new ways to enjoy my greens! !